Oh my goodness, is this recipe ever good. Peanut butter turtle bars combine peanut butter, caramel, and chocolate in one of the best cookie recipes you will ever taste. 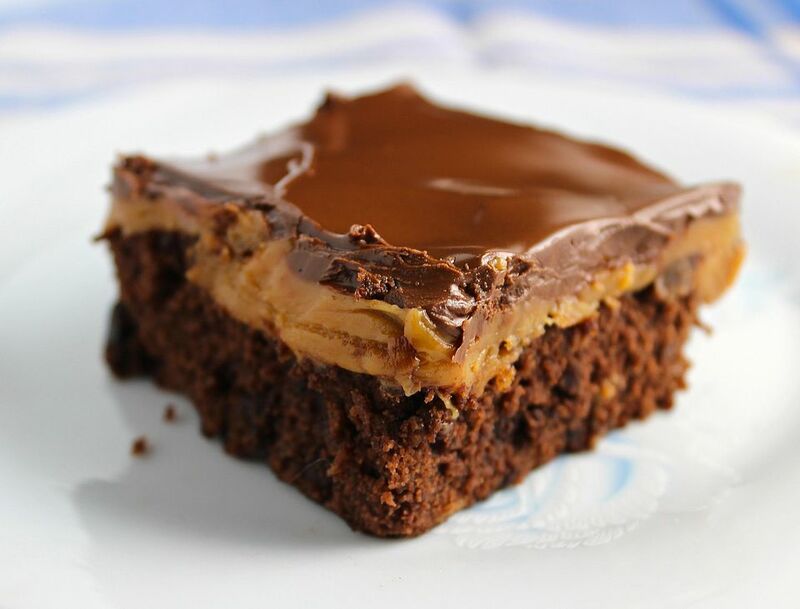 And yes, there is 1 1/2 cups of peanut butter in this swoon-worthy recipe! This is one of the best ways to dress up a brownie mix and make it something special. No one will ever guess that you started with a mix. Serve this brownie for a special occasion. It's also perfect for a bake sale or a holiday cookie tray. Preheat the oven to 350 F. Spray a 13" x 9" pan with nonstick baking spray containing flour and set aside. In a large bowl, combine the brownie mix, 1/2 cup peanut butter, water, oil, and eggs and mix until combined, then beat for 40 strokes. Pour the batter into the prepared pan. Bake for 35 to 45 minutes or until the brownies are just set; do not over bake. Put the brownies on a wire rack while you make the filling and frosting. For the filling, in a medium microwave-safe bowl, combine the caramels and light cream. Microwave on high for 2 minutes; remove and stir. Continue microwaving, as necessary, for 30 second intervals, stirring after each interval, until the mixture is melted and smooth. Stir in 1/2 cup peanut butter and pour over the brownies. For the frosting, in a small microwave-safe bowl, combine the chocolate chips and 1/2 cup peanut butter. Microwave on high for 2 minutes; remove and stir until smooth. Pour carefully over the caramel layer and spread to coat. Let stand until the filling and frosting are set, then cut into bars.